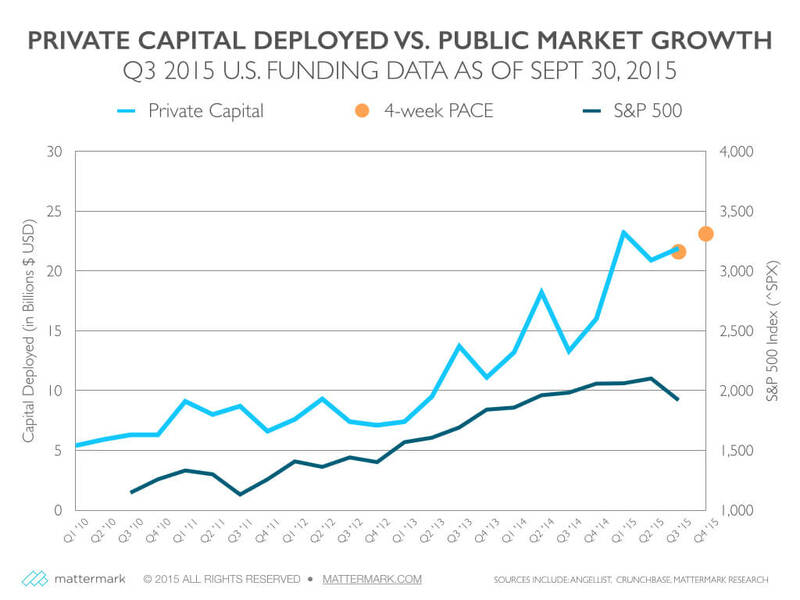 While public markets ended the quarter in a struggle to rally off 52-week lows, private investment has continued to flow with the quarter-end mark of $21.9 Billion dollars deployed to U.S. private companies at the 2nd highest level since the beginning of 2010. Our original pace mark, based off activity in the first 4 weeks of the quarter, suggested funding levels would reach $21.6 Billion and we were pleasantly surprised to see our forecast off by just 1.4% below actual. Based on the past 4 weeks of funding announcements which totaled $7.7 Billion, if Q4 funding activity were to continue at the current pace the total capital deployed would be $23.1 Billion. This is just shy of the record high quarter set in Q2 2015 at $23.3 Billion. Looking for resources to help you research startups and venture capital? Sign up for a free trial of Mattermark Professional to access the underlying data for these graphs, as well as in-depth profiles of more than one million high growth companies. Join the leading buy-side and sell-side deal professionals in using our tools to prospect the world’s fastest growing companies.